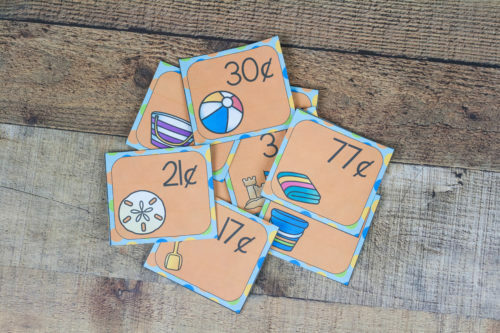 Learn all about coins and money with these fun beach money games! 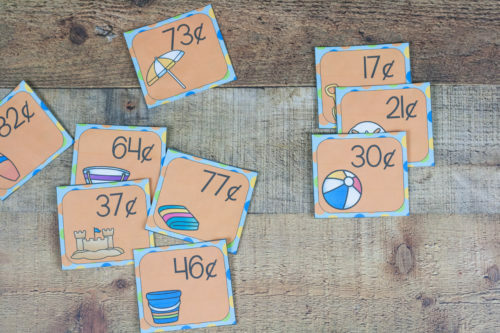 Count coins, compare amounts, and pretend to buy the beach items.Summer is here and that means it’s time for the beach! Unfortunately, we don’t have a beach nearby. So we are spending time pretending to be at the beach. 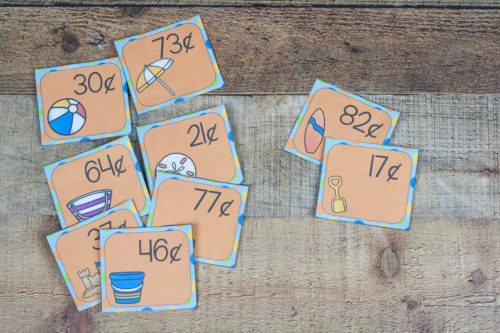 These beach money cards are helping us pretend as we “buy’ what we need for the beach! It is beach week all week! Cassie from 3Dinosaurs.com, Deidre from JDaniel4sMom.com and I are bringing you a fantastic amount of beach themed printables this week. 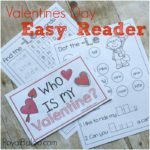 Make sure to check back all week, or just sign up for my newsletter! There are two sets of cards in this deck and countless games to play. The first set includes pictures of beach items with a price next to them. Now I’ll warn you, the prices are totally unrealistic for this day and age. But frankly, there isn’t much you can buy for less than a dollar these days. So just go with it. I recommend printing on cardstock and laminating these bad boys. They are flimsy on plain paper but will stand up to a good deal of abuse when laminated. The second set is made up of coins. Each card has a different amount (they do not directly relate to the prices of the beach items). Game 1: Can I Buy It? The first beach money game I have is called ‘Can I Buy It?’. It’s sort of like memory. Set out all of the beach item cards in rows and columns, upside down. Then set the stack of coin cards next to it. On your turn, flip over the top coin card and any of the beach item cards. Determine if you will have enough money from the coin card to buy the beach item. If you do, take the beach item (but not the coin card). If not, put the beach item back where it was. The coin card should be placed at the bottom of the coin card deck. These cards need to be reused! Whoever has the most beach items at the end is the winner! For this game we only need the beach item cards. You have $1 to spend and have to buy two things at a time. What items can you buy together? Try to make as many pairs as possible! Game 3: How Much Can I Buy? Similar to the last game, you have $1. But this time you have to see how many items you can buy. Try to get as close to $1 as possible! What happens if you find another dollar? What else can you buy? I’m sure there are many more games that could be played with these cards, too. Have fun and experiment!